Services & Capabilities – Clark Kennedy Co. Inc.
On site operations include welding, plasma arc cutting, hot metal forming, cold metal forming, stress relieving, blacksmithing, machining and custom R & D projects. We can fabricate in most materials including carbon steel, stainless steel, aluminum, clad material, duplex and others (including customer-supplied materials). In addition to tank end products, Clark Kennedy Co. Inc. also manufactures an extensive line of elliptical handhole and manhole assemblies. This product offering ranges from handhole and manhole rings and handhole and manhole covers, supplied separately, or entire assemblies. Entire manhole assemblies include manhole rings, manhole covers and yokes to hold and position the manhole lid. Manhole and handhole assemblies are the most economical and reliable means for providing access to pressure vessels. Clark Kennedy Co. Inc. also supplies hinged lid closures. T-bolt (or t bolt) hinged closures provide simple and quick access. T bolt hinged closures are available in standard sizes ranging from 6″ to 42″. These hinged closures can be supplied to withstand pressures to 300 psig. Low pressure circular hinged closures are also available from Clark Kennedy Co. Limited. These low pressure closures are capable of handling 50 PSI/full vacuum. One advantage of low pressure closures is their hand tightening feature. Hinged access lids are provided in either carbon steel or stainless steel. A service provided by Clark Kennedy Co. Inc. is the application of flanging to large, deep cones. Flanged cones are sometimes used on the ends of tanks or similar vessels. 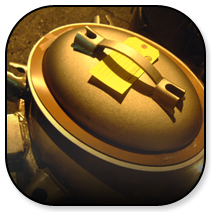 We can roll a flange on customer-supplied cones to facilitate welding the flanged cone to the body of the tank.